From being a court reporter to serving as a correctional officer, there are many attractive criminal justice jobs available throughout the state of Delaware. Many criminal justice schools in Delaware offer comprehensive training programs that include internships and hands-on training at area law enforcement training facilities, legal firms and state prisons. This guide includes tools and information that can make it easier to map out a rewarding career path in the criminal justice field in Delaware. Finding the right school that offers criminal justice degree and training programs can be challenging for those who are on a tight budget, are new to the state or are changing careers. 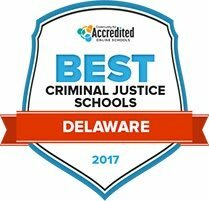 Compare criminal justice schools in Delaware using the rankings below. This list provides a look at the best criminal justice schools in the state, ranked based on important factors like tuition costs and graduation rate. Students interested in a career in the criminal justice field may wish to pursue an associate degree in criminal justice at Delaware Technical Community College, Terry. In addition to their degree-specific curriculum, students will also be provided with a well-rounded core education that will prepare them to an efficient worker in any career they might pursue. As earning an education is a social experience, DTCC Terry is invested in providing its students with an enriching experience through socially integrated workspaces, special interest organizations, and numerous dining locations at which students may visit with one another. The Owens campus of Delaware Technical Community College serves students located near Georgetown and the greater Sussex county. As the first location for DTCC, the campus has helped many students reach their full academic potential. Students are able to pursue both undergraduate and graduate degree through partnerships with Delaware State University, the University of Delaware, and Wilmington University while remaining in Georgetown. Criminal justice graduates in 2015 boast a 93.5 job placement rate after completing their program which may be accredited to the comprehensive and challenging program. The Stanton/George Campus provides academic opportunities for students looking to study criminal justice through the Delaware Community College system. This campus aims to support student advancement and promote professional opportunities while upholding DTCC's core values. Graduates of the criminal justice program in Stanton boast high employment rates and competitive salaries upon successful program completion. Through the criminal justice program, students can pursue careers in areas such as environmental justice, corrections, law enforcement and criminal law in public and private agencies. Wilmington University is a private, non-profit school offering several programs related to the criminal justice field, with most available fully online or at several of the university's campuses. Students also have accelerated degree options, and can transfer in credits for a completion degree in criminal justice. Undergraduate degrees include social and behavioral sciences, criminal justice, computer network and security and legal studies. Master's degrees are in administration of justice, homeland security and an MBA with homeland security concentration. Students can earn related certificates simultaneously with degrees in areas such as child advocacy, conflict resolution, crime scene investigation and digital evidence recovery. Goldey-Beacom College offers a bachelor of arts in criminal justice focusing mainly on ñwhite collarî and ñcyber terrorismî crimes. The university offers career services for students to help them focus on preparing resumes, practicing interview techniques and making connections with businesses and alumni. Students can utilize the campus tutoring center in the library to study for exams, as well as make up exams. The on-campus security office is open 24/7 throughout the entire year to enhance student safety. The financial aid office is also available to answer questions regarding payment options, scholarships, and other aid programs. Whether a student decides to pursue a career as an investigator, wants to explore forensics, or is interested in transportation security, they will need to consider several factors when comparing criminal justice schools in Delaware that offer the appropriate level of training for success in their chosen field of specialization. Use the tool below to compare all accredited criminal justice schools in the state based on factors such as student population, tuition fees, acceptance rate and concentrations. Attending criminal justice school in Delaware can be a rewarding choice after graduation, especially compared to other states around the nation. Delaware offers several above-average career options in the criminal justice field, compared with salary and job growth projections in other places across the country. The graphs below show how Delaware stacks up in criminal justice compared to the national average, and may help steer aspiring students towards more promising criminal justice specializations. Delaware's highest concentrations of criminal justice jobs can be found in its major cities, and according to the FBI's annual list of cities with the most violent crime, Delaware's largest city, Wilmington, ranks third in the nation. This explains the higher demand for police and patrol officers and legal professionals, highlighted on the map below. Those interested in criminal justice school in Delaware can look here for more information on specific protective and legal service employers, and scroll over the markers on the map to see more detailed information on the wages and employment numbers across different areas of the state. Providing resources for business owners and investors looking to incorporate in Delaware, the Department of State's Division of Corporations is a hub for important information on corporate legal operations and regulations. This page also includes online tools for checking the status of business entities. Overseeing a variety of economic and development issues in the state, the SOS provides employment information as well as details on services and community action items on this website. A collection of information for small businesses, with details on everything from starting a business to local business group meetings. Members can also search the business directory, explore job postings and attend business and networking seminars. A growing network of young professionals in Delaware, exclusively set up for those between the ages of 21 and 40. With a mission of community involvement, leadership skill building, networking and professional development, this group offers various involvement committees on everything from infrastructure and transportation to educational advocacy and taxes. This comprehensive index provides information on State of Delaware business licenses and registrations. This resource also includes listings of different professions and industries operating within the state. A division of the State of Delaware, the BCC promotes this supervisory program for offenders as an alternative to incarceration. Those interested in probation and parole work can get more information on the BCC's efforts here, as well as search job openings in the employment section. The labor organization representing Delaware's correctional workers, this site provides information on college scholarships, community activism and the general mission and advocacy programs associated with Delaware's corrections department. A site providing victim services information and details about different bureaus and divisions, the DOC is a good resource for those exploring corrections careers. Information on upcoming events and meetings can also be found here, as well as a link to employment opportunities within the state. The hub page for Delaware's branch of the national Vera movement to improve the justice system and promote safety and fairness across law enforcement and correctional programs. With studies and stats on incarceration and details about community projects, this site provides a place for prospective students to get involved. This community-based group assists with re-entry service programs for offenders so they are less likely to commit crimes again. In addition to links to their mentoring programs and residential re-integration centers, Delaware Valley's site provides career and volunteer information. This website features eServices, information about all of the courts within the court system, legal forms and rules. Also includes oral arguments and employment opportunities in the administrative officer the courts. Led by the honorable Leonard P. Stark, Chief Judge, the district court handles a variety of legal cases throughout the state. The website includes juror information, resources for attorneys and legal forms. Comprehensive listing of InfoCenters with resources for children, families, elders, human resources and judicial officers. Also includes information about the administrative office of the courts. Dedicated to protecting the civil liberties of Delaware residents, this local branch of the ACLU provides information about volunteer and job opportunities in the legal and protective services fields. This site provides up-to-date information for those taking the bar exam and looking for more details about bar exam questions and results. A membership based organization of attorneys in Delaware, the DTLA website provides information on continuing education opportunities and webinars, and an attorney search for the public. A comprehensive website featuring upcoming live seminars for CLE credits, resources for attorneys and legal information for the public. Designed for attorneys who want to volunteer their legal services to residents throughout the state of Delaware, this site also includes a comprehensive listing of attorney volunteer opportunities. This list of Volunteers in Police Service (VIPS) branches in Delaware provides more information on how to get involved in local community and volunteer enforcement operations across the state. VIPS support resource-constrained police departments, and may provide an opportunity for future law enforcement officers to get started in protective services. A specialized training program for law enforcement in Delaware, CIT focuses preparing officers for encounters with subjects with mental illnesses. This course highlights de-escalation and negotiation techniques and overall risk assessment, and the site provides information on future training sessions. A membership group for police chiefs and executives from all branches of law enforcement in Delaware, the Police Chiefs' Council works to solve law enforcement issues on the state, regional and federal levels. They offer specialized training and professional development for leadership in law enforcement. Maintained by the State of Delaware, this part of the website includes information about licensure and renewal procedures, private investigation and agency licensing requirements and other information for those interested in working in the field of private investigations. Supporting women in law enforcement working in Delaware, Maryland, Virginia, Washington, D.C., Pennsylvania and New Jersey, MAAWLE provides a scholarship for college students interested in enhancing the role of females in law enforcement. Comprehensive resource with the latest statements from the department secretary, public meetings, business services and contractor licenses and certifications. Provides information about the mission of Natural Resources Police Officers, information about advisory councils and licenses, permits and registrations. Information about state parks in Delaware, nature and history programs, volunteer opportunities and internships at various state parks and attractions.